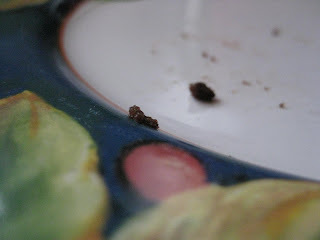 A couple months ago, when I was in the middle of my "no chocolate for Lent" pact, someone shared with me a trick to make brownies with a can of black beans. This mom made up a batch and then cut them into tiny squares to use them as a reward for her daughter who was potty training. I filed away the idea of trying these brownies until after Lent had ended, and well, since Lent ended well over a month ago, I figured it was time to give them a try. Preheat your oven to 350 degrees (or whatever temperature your box of brownie mix instructs). 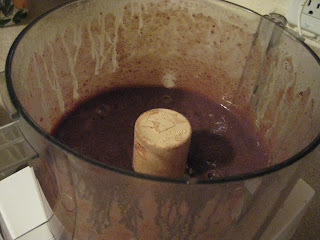 Add the brownie mix and stir until just blended. Pour into a greased 8 by 8 inch pan and cook according to the brownie mix instructions (we did 34 minutes). Cool and cut. Don't they look good? But how did they taste? This is my plate a few minutes later. They were delicious! The brownies turn out less cake-y and more fudge-y than typical brownies, but let me tell you, they were fabulous. I let the boys each try a square and they gobbled them up. The best part? Since there were no raw eggs in the batter, this SPC was able to lick the bowl clean to her heart's content. I'll have to try this since there's no eggs!! Looks good. Scares me a little but I want to try it!!! I love your ideas and your recipes but I am not convinced that I would like those. You will have to prove me wrong. 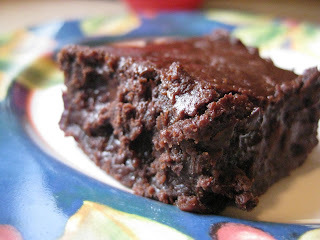 We had these brownies for dessert tonight and they were great! Amy and I told the family that there was a secret ingredient. They guessed all sorts of things- but no one came up with black beans. I made these this morning and they are yummy!